Submissions to the Transport Masterplan were due by midnight tonight.I’ve included my submission to it below. The questions are in bold, with my responses in after that. I got in with an hour to spare. It’s quite long, so if you just want the highlights, read my responses to the second and last questions. TRANSPORT OBJECTIVES : Are the objectives for future planning for transport in NSW appropriate and comprehensive? Overall the discussion paper is quite comprehensive, and I’m generally quite happy with the direction that it lays out for transport in NSW. TRANSPORT OBJECTIVES : Do you have any other objectives to suggest for both public transport and roads? 1. Congestion charging and uniform tolling. Currently there are countless different tolling systems throughout Sydney, ranging from free to distance based to flat fee to time of day. There is a significant potential to set tolling in such a way as to provide funding for additional transport spending AND as a form of congestion charging to discourage private car use during peak hour. 2. Car share. This has taken off in the inner city parts of Sydney, with some limited expansion into the North Shore and Parramatta. Though it is supported at the local council level, there is huge scope for car share policy to be expanded to the city-wide level in order to encourage take up, and thus discourage car ownership/use. 3. Bike share. As a “last mile” strategy, bike share can greatly expand the catchment area of public transport by allowing commuters to ride a bike after alighting from their public transport vehicle. This is a much better option than encouraging commuters to take their own bike on buses/trains, as this uses up valuable space onboard the vehicles. Helmet laws should be considered, and if any rollout is ever done then it should be done at a large scale. Small scale bike share schemes have been shown to fail due to insufficient coverage (e.g. Melbourne) whereas successful schemes invested in a substantial and wide fleet of bikes (e.g. Paris and London). SYDNEY TRANSPORT : In solving the transport problems in Sydney, what transport mode should be the first priority for new investment, bearing in mind the need for a socially equitable and environmentally sustainable transport sector? Transport modes are a transport solution to a transport problem. To pick a mode first is putting the cart before the horse, as it seeks to pick a solution and then go looking for a problem. Ideally we should be highlighting the problems and then selecting the most appropriate solution (and hence transport mode), which will be different depending on the exact problem. In some cases, the solution may be buses, in some cases it may be rail, in some cases it may be a re-organisation or upgrade of existing services. But the key thing is to work out the problem first, and find a solution second. SYDNEY TRANSPORT : What do you consider to be the main priorities for investment in Sydney’s transport infrastructure? Public transport should be a priority. In the last 2 decades, many public transport projects have been deferred or cancelled. Meanwhile, every single new freeway that has been proposed has also been built. Freeways need to go to the bottom of the pile for the next 20 years in order to being public transport infrastructure back to square one. 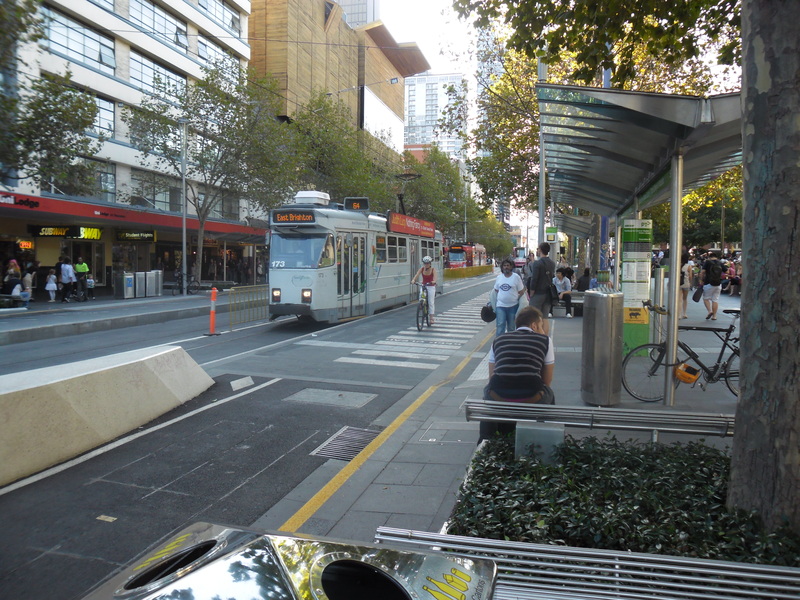 SYDNEY TRANSPORT : How can the road network be better utilised and enhanced? Get people out of cars and into public transport or out of the peak and into the off-peak. There is enough existing road capacity out there to transport Sydney’s population without having to build more roads. There are many roads that are currently used for travelling through, rather than used for arriving at a final destination. For example, many people drive through the CBD without actually stopping there. This sort of traffic belongs on a freeway of some sort. Perversely, there is a freeway that people could take (the Cross City Tunnel), yet people choose not to use it because there is a toll. A logical solution would have been to toll the surface roads via a congestion charge, which would then fund a free CCT journey. SYDNEY TRANSPORT : What are your priorities for public transport services in terms of frequency, reliability, cleanliness and safety? Frequency is freedom. I love turn up and go public transport that is frequent enough that I don’t need a timetable. Depending on the context, this may mean 5, 7, 10, 15 or even 20 minute frequencies. SYDNEY TRANSPORT : What criteria should determine whether light rail or bus transport should be preferred? Light rail has a few benefits over buses, such as higher capacity, more popular appeal, faster acceleration/deceleration, less noise, certainty, etc. However, many of the benefits normally attributed to light rail, such as exclusive rights of way of better stops/stations, are actually also available to buses and are not technology based. Such things should not be considered when deciding between the two technologies. SYDNEY TRANSPORT : What are the current barriers to using multiple transport modes to complete a journey? How can the barriers be addressed? Integrated fares exist with myMulti tickets, but they are limited to weekly tickets and are CBD centric (a daily ticket also exists, but is far too expensive for all but a few users). Additional myMulti tickets should be available, such that Zones 1, 2, 3, 1+2, 2+3 or 1+2+3 are available, for users in outer suburbs who do not commute into the CBD. Fares should cost the same to get from A to B, regardless of the number of vehicles used to do so. Currently, using 2 vehicles costs more, despite the fact that this is an inconvenience, not a premium service as the cost would suggest. Resolving this can take either the form of point to point fares (which can be done once Opal is rolled out) or simple zonal fares (as myMulti tickets operate). Either is fine, but whichever option is taken the fare system should be built up from the ground up to be simple. Grandfathering the existing fare structure would complicate things unnecessarily. SYDNEY TRANSPORT : How can the transport requirements of Sydney Airport and Port Botany be best addressed? A second airport should be built at Badgerys Creek, where the joint NSW-Federal study into a second airport recommended it be built, in order to relieve the pressure on Kingsford Smith Airport and to provide jobs to Western Sydney, where the majority of the population growth will occur. SYDNEY TRANSPORT : If there are to be more greenfield land release areas in Sydney, should there be a focus on developing public transport options as part of strategic land use planning for Metropolitan Sydney? How should this policy be given effect? Future developments should be designed more like Rouse Hill, which has a dense town centre at its core which acts as a transport hub/interchange, rather than Kellyville, which is streets upon streets of houses and little else, forcing residents into their cars as the only transport option. Such a strategy, along with reservations for future rail corridors, allows for buses to serve these new areas until sufficient population/funding is available to extend heavy rail into the area. Good planning for public transport also increases land value, and accessing some of the increase in the value of the land can help to fund this new transport infrastructure through, for example, additional levies on developers of these greenfield sites. REGIONAL TRANSPORT : What are the key transport objectives for your region? Rail lines have been poorly maintained and trains today run no faster than they did for most of the past century. There is little reason why trains in non-urban areas should not be able to go at 160km/hr (the maximum speed of an XPT train). Such an improvement could make living in Wollongong or Newcastle and commuting into Sydney a viable option, or getting a train between Sydney and Canberra competitive with air travel. FUNDING : How much would people be prepared to pay for further investment in the transport system and what would be the expectation flowing from these investments? I can’t put a number on this, or speak for the entire population of NSW. But there does seem to be an increased appetite for government spending on critical infrastructure, such as transport infrastructure, given the infrastructure deficit that has built up over recent years and the cost pressures that it has caused. FUNDING : Given the limitations on funds available for future transport investment, what mechanisms should be employed to manage demand? Congestion charging could help to manage private vehicle flows to limit congestion. Also, encouraging employment in centres outside of the CBD, to make use of existing capacity on public transport from vehicles going in the counter flow direction during peak hour could allow unused capacity to be used, rather than having to invest in increasing existing capacity. FUNDING : Should new revenues or charges be explored to deliver the transport infrastructure needs within a realistic timeframe? Absolutely. Now is not the time to be ruling things out. FUNDING : If further road user pricing were to be introduced, how should this operate? For example, by distance travelled? By vehicle type? Or should it be area based? Distance travelled is a much more effective method of tolling, now that the technology exists to do it that way. Time of day tolling (congestion charging) should also be considered, as a way to discourage peak hour traffic and also to fund additional transport infrastructure. OTHER COMMENTS : Are there any other comments about the NSW Long Term Transport Master Plan Discussion Paper that you have? The federal government is currently offering $2.1 billion in funding for public transport. Unfortunately, due to the political constraints of neither the state nor federal governments wanting to break a political promise, this $2.1 billion is not currently available. At a time when so much infrastructure needs to be built, losing this funding should not be considered an option. It is therefore imperative that the NSW government do what it can to negotiate a compromise solution to this problem. This could involve offering to build some sort of high capacity transport link between Parramatta and Macquarie Park, which could be done at a fraction of the cost of the Parramatta to Epping Rail Link and thus allow the construction of the Northwest Rail Link (which is the current government’s priority). A number of proposals to do this (through BRT, light rail, etc) are currently on the table, and ultimately I care less about the option taken as I do about a compromise being struck. But the worst outcome would be for both governments to stick to their guns, because then we all lose out. 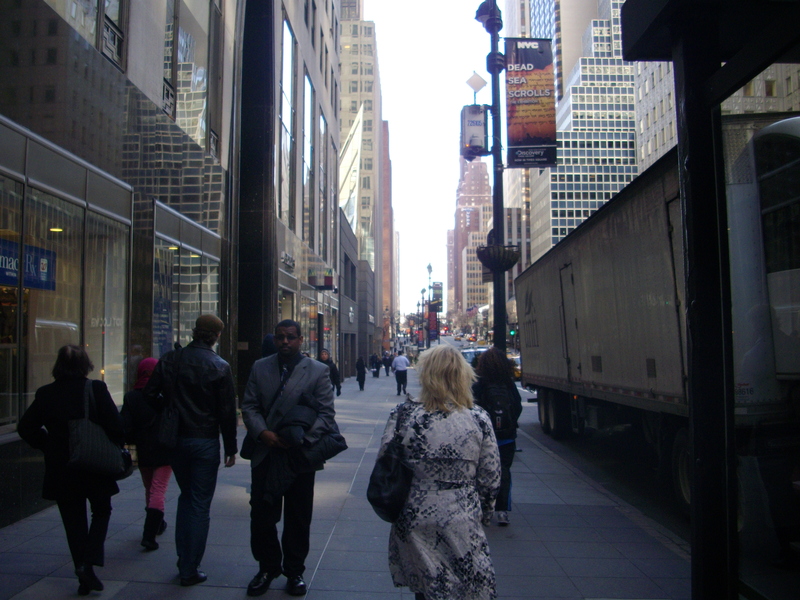 I liked the New York transport system a lot when I was there a few weeks ago. But one thing I think they can definitely improve on is the clarity of their subway entrances. Some were relatively easy to find, while others were so well hidden you would not know they were there unless you were standing right in front of them. I’ve included a couple of examples to illustrate my point. First is a good subway stop. It is clearly obvious from afar that it is an entrance to the subway, and you can also see which lines it serves. If applicable, this would also state which direction the trains from this platform go in (a quirk which applies to some stations on the New York subway system, whereby the entrance is to only one platform and not the other, but to no other system I’ve ever been on). 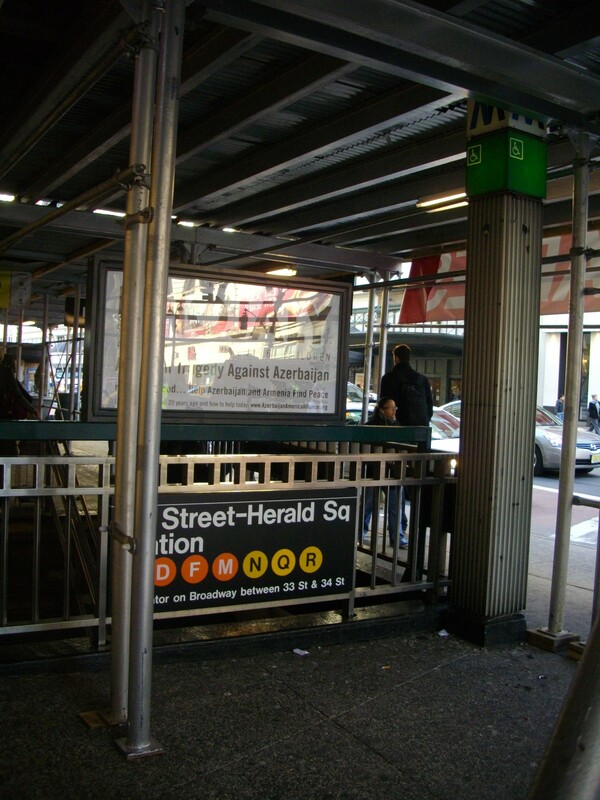 Compare that to this other subway entrance near Grand Central Terminal in Midtown Manhattan. 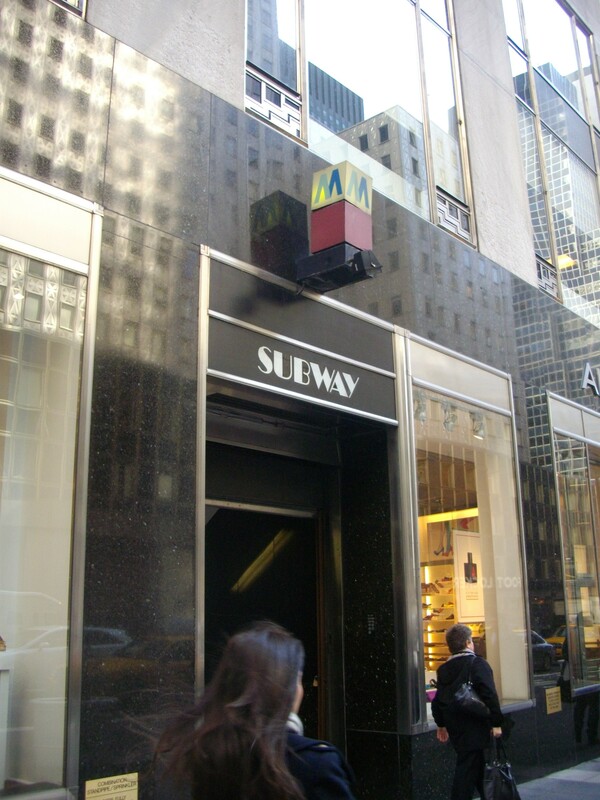 I knew there was a subway entrance nearby because Google Maps told me so, but could not find it anywhere on the street. If you can find it, then you’ve done a better job of finding it than I had done. In case you need some help, this is what you need to be looking for. I did end up finding it, but only once I got right up to it. There was another subway entrance, on the South East corner of Central Park, which I literally did not find until it was right in front of me. And in that particular case I had both found it on Google Maps and asked a local for directions. Despite both these things, I could have sworn there was nothing there. The example from above was actually easier to find, as I managed to spot it on my own. I’m guessing this is largely due to the New York subway being so old, though why the signs can’t be changed seems strange to me. It definitely is an example of something that is done better in Sydney than New York when it comes to the trains. On other measures, however, Sydney is far behind New York.